What a difference a year makes. 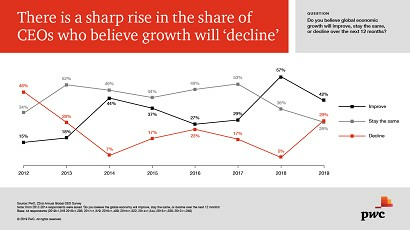 Nearly 30% of business leaders believe that global economic growth will decline in the next 12 months, approximately six times the level of 5% last year – a record jump in pessimism. 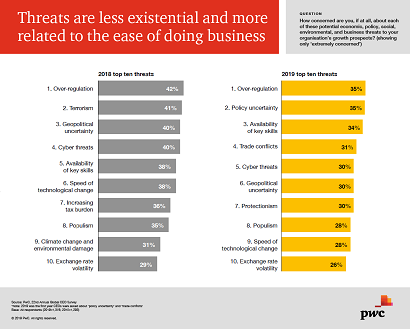 This is one of the key findings of PwC’s 22nd annual survey of 1,300 plus CEOs around the world, launched today at the World Economic Forum Annual Meeting in Davos. This is in vivid contrast to last year’s record jump, 29% to 57%, in optimism about global economic growth prospects. The other three countries rounding out the top five for growth include Germany at 13% down from 20%, India at 8% down from 9% and the UK at 8% down from 15%. As indicators predict an imminent global economic slowdown, CEOs have turned their focus to navigating the surge in populism in the markets where they operate. Trade conflicts, policy uncertainty, and protectionism have replaced terrorism, climate change, and increasing tax burden in the top ten list of threats to growth. What Needs to be Done to Attract Investors in Traffic Projects?